This part of the website and this page, in particular, has been dedicated to everything about long-term online investing. We’ll cover topics such as investing in stocks for beginners, cryptocurrency investments, the best brokers suited for long-term investments, and so forth. Just be aware that we’re focusing on online investments which mean we won’t cover investments such as property, cash, and businesses. If you’re wondering how to invest in stocks online or what the difference between day trading and long-term investments are, you’ve come to the right place. So without further ado, let’s get into it. A long term investment is simply an investment that spans over a long time period. The most common types of long term investments are in stocks or shares. Brokers that offer CFDs (contracts for difference) are typically used for investments up to a few months. What Qualifies as a Long-Term Investment? A long-term investment is really just an investment that spans more than a few weeks but is usually much longer than that. Typically, securities that increase slowly are best suited for long-term investments, but that can vary a bit. The most common security for long-term investments is stocks or company shares. Many times when buying stocks the investor sets up goals that span several years with the goal of selling the said stock for profit a few years down the road. Other securities that are popular for long-term investments are indices of all kinds, bonds, and futures, for example, commodity futures. Lately, cryptocurrencies have become another great option for online investments, but more about that in a little bit. And in our opinion, that sums up long-term online investing in a very good way. An easy way to understand long-term investments is to compare it with day trading. Day trading is defined as investments that are bought and sold within a very short amount of time. A trader usually handles several trades per day. 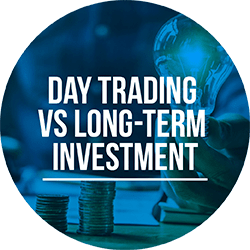 There is also a type of day trading that spans a longer period of time – usually a few days or a week or two – called swing trading. Long-term investing is the complete opposite of that. Instead of finding opportunities to benefit from quickly, you want to find an investment that will grow steadily over a longer period of time and thus provide you with a larger return in the end. The benefit of this is that you don’t have to spend every day in front of the computer analyzing prices and calculating indicators. Instead, you do your initial analysis, place your investment, and then sit back and wait. Unless you want to invest more, of course. Investing in stocks for beginners is probably easier than you think. If you’re a beginner investing in stocks, your first job is to find a broker that suits your needs. Some brokers are connected to the world’s exchanges, and they let you buy the stock from the company. When investing like this, you become a shareholder with rights to vote on certain important decisions regarding the company. There is a multitude of stockbrokers offering these services online, and chances are that your personal bank has services that let you buy stocks from the exchanges. Most would agree that this is the traditional way of investing online. Your other option is to invest in stocks using derivatives such as CFDs, options, etc. However, derivatives trading is very different from traditional stock investments, and it’s important that you understand the differences. Therefore, we cover the topic in detail further down. The one thing that the two types of online investments have in common is the need for a broker. Today there is a multitude of online brokers offering a range of different derivatives suited for long-term investments and we can help you find one that suits your needs. Other securities such as bonds, indices, futures, and assets are not stocks but usually sold on the same exchanges as stocks are. Typically, since these securities are sold together with stocks, you can use the same brokers to invest in them. The same goes for anyone looking to buy these securities as derivatives since most CFD brokers offer access to indices, bonds, etc. Cryptocurrencies might not be the first thing you associate with long-term investments, but the truth is that this new market space has proven to be highly lucrative for people with patience. Between 2009 and the end of 2017, Bitcoin grew from being practically worthless to selling for almost 20,000 dollars, and we don’t know of any other asset that has experienced such an incredible development. Naturally, that means that cryptocurrencies offer great opportunities for long-term online investments. Also, they have proven to be extra popular among beginners investing online, since the younger generation seems to be more fascinated by these digital currencies than the older investors. The best part is that most of the leading CFD brokers and even some of the most well-established stockbrokers have added cryptocurrencies to their selections lately, making it easy to long-term invest in both stock and cryptocurrencies at the same time. So, we’ve already mentioned that one can buy stocks and other securities as derivatives, but what does that really mean and how does it differ from traditional long-term investments? One of the most popular derivatives today is called CFD. A CFD, or Contract for Difference, is a derivative based on the price of an underlying asset such as a stock, bond, or even a cryptocurrency. As an investor, your job is to predict whether or not that underlying asset will increase or decrease in price. Unfortunately, CFDs aren’t really designed for long-term investments and are better suited for day trading because most CFD brokers apply overnight fees for CFDs that aren’t sold when the market closes. You also usually use leverage to buy CFDs and that can increase your losses substantially, especially over a longer period of time. In order to combat that problem, many of the top online brokers have started implementing new ways of long-term trading online using their services. For example, several CFD brokers today are offering online stock investments directly from the exchanges similar to how a traditional stockbroker does it. Others have launched cryptocurrency wallets and exchanges to allow their customers to place long-term cryptocurrency investments without any extra fees. Investing in stocks as a beginner is associated with high risk, and it can be a daunting experience, to say the least. In fact, many people decide to never invest because they are scared of the potential negative consequences of losing. And yes, any type of online investment is associated with the risk of losing the invested funds which means it’s important to be careful. Learning how to manage risk and never investing money you can’t afford to lose are two great ways of minimizing the risk. That being said, the best way to limit the risk is to practice trading, and today there are systems that let you practice for free and without risk. By opening a long-term demo account with a broker, you get access to a real trading platform with assets mirroring real market prices. However, instead of using real money you use virtual money which means you never risk losing anything. Obviously, you won’t make any profit either, but it will provide you with the necessary skills that experienced traders in the past could only dream of. Besides practice, one of the most important steps for anyone trying to learn how to invest in stocks online is to find the right tools and equipment. Without the right tools, you won’t be able to analyze securities properly and your trading experience, as well as your results, will suffer. Because of this, we recommend that you spend some time researching different brokers trying to figure out which tools you prefer to use and how you like a broker to be. As mentioned earlier, there are a lot of brokers offering online investment opportunities, and it can be a draining experience trying to find a good broker among all of the available options. But you don’t necessarily have to do the research yourself. In an attempt to try and help our readers, we spent countless hours evaluating and reviewing long-term investment brokers from all over the world. We’ve traded on their platforms, double checked their reputation, and put their software through rigorous tests. We then proceeded to combine that data with our own personal experience. The result of all that work is a list of the best investment brokers in the industry, and it’s the perfect resource for anyone looking to find a broker to start trading with. Obviously, all of the brokers we recommend are licensed and regulated, meaning they are completely safe to use. Also, we would never think of recommending a broker that we wouldn’t feel comfortable using ourselves. Never before has mobile trading been as popular as it is today so a large part of our evaluation process is focused on the brokers’ mobile trading apps. In fact, a broker wouldn’t make it to our list of recommended brokers unless they offered really good long-term mobile trading opportunities. If you’re looking to start long-term investing on a mobile device we can help you. Using the same methods as we did to evaluate the best brokers, we’ve also curated a list of the best investment apps. In that list, you’ll find apps that have been developed to offer long-term stock trading and access to the world’s exchanges. 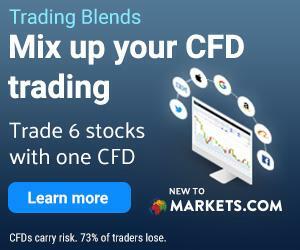 You’ll also find some of the leading CFD trading apps as well as newer apps that have been optimized for cryptocurrencies. What is great with all of the recommended apps is that the brokers that run them all offer demo accounts. Naturally, that means that you can open a free account and test the investment apps before deciding which one suits your needs and trading style the best. In addition to the best brokers and the best investment apps, we’ve also taken a closer look at the world’s leading investment firms and companies. For example, some of the leading brokers are owned by companies that only offer that one particular broker. And even though their broker might provide a top platform, it doesn’t make the company a leading force in the industry. In our opinion, a firm that wants to qualify as one of the best investment firms needs to offer more than just a broker. A company like the British IG Group is a great example. They offer a trading platform for CFD and forex trading perfectly suited for day traders, but they also offer their customers the opportunity to invest in stocks and securities directly from the exchanges. In addition, IG Group produces investment news and market updates on some of the most well-known platforms in the industry. And as icing on the cake, they have a binary options trading platform for the American market called Nadex. As you can see, that means IG Group offers a large variety of established investment resources and platforms, making it a top investment firm. However, IG Group is not alone, and we’ve put together a carefully handpicked list of the best investment firms and platforms right now. This part of the website is dedicated to all things long-term investment, whether that’s investment tips and strategic advice or recommendations. In other words, if you are interested in long-term investment opportunities, this section is your go-to resource. We can recommend you the best investment platform for your particular needs as well as a mobile investment app that you can bring with you wherever you go. And if you need some help getting started with long-term investment, or you’re looking for tips and tricks, we can help you with that as well. Furthermore, we have dedicated another part of this site to day trading if that is more up your alley. And if you ever need more information on a specific market or want daily market updates sent to your preferred device, we offer that too. Check out the sections in the main menu above or click one of the links on this page to be redirected to the sections that interest you. And don’t hesitate to contact us if you would ever need help or have any questions.